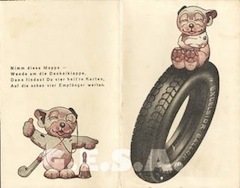 The Hanover (Hannoversche) Gummiwerke Excelsior rubber processing company started its existance in Hanover-Limmer in 1862 as the Rubber-Comb-Comp, & was the oldest rubber factory in Hanover. 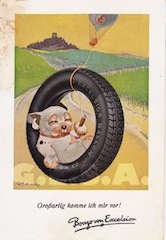 They manufactured technical rubber goods & tires from 1890 to 1928 with up to 6,000 employees. 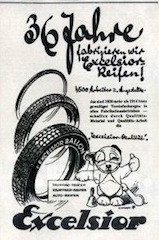 For their 50th anniversary in 1912, the company was renamed Hannover Gummiwerke Excelsior AG to give it a more distinguished name, which became shortened to "Excelsior", & locally in Hanover as "The Ex". 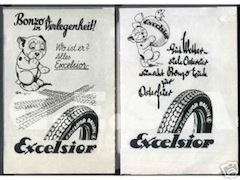 The name "Excelsior" had previously been established as a brand name for tires in Germany. 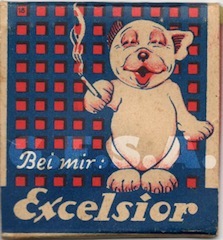 The renewal and expansion of the "Excelsior AG" in the 1920s were financed by a total of 6 investors. 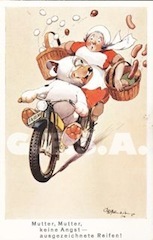 However in early 1922, Continental AG acquired more than 25 percent of the share capital & thus became the major shareholder of "Excelsior AG". 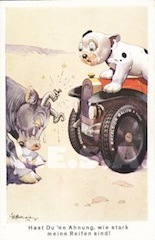 Eventually Continental AG acquired more stock shares of Excelsior AG so that the two companies merged in 1927. 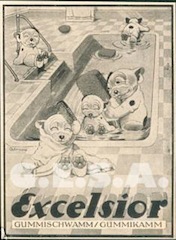 The Continetal Group continued the Excelsior brand name up to World War II. 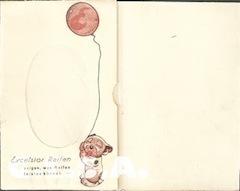 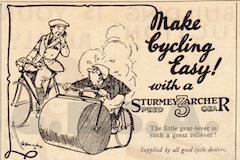 It is not known who commissioned Studdy to do a series of adverts depicting Bonzo in the late 1920s, but a large variety appeared as postcards, posters, flyers & other such materials. 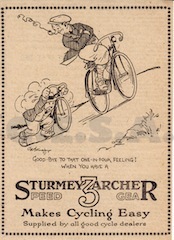 A great set of four postcards in a special folder packet. 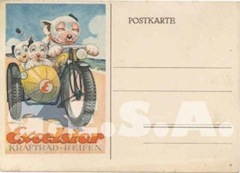 Three more postcards & a receipt card. 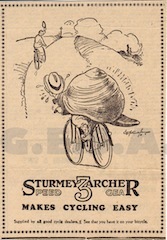 A selection of printed adverts from magazines & newspapers. 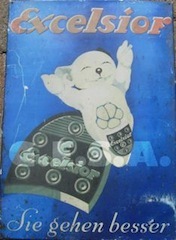 A large enamelled metal sign. 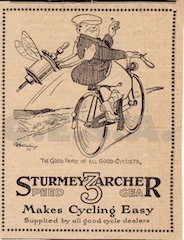 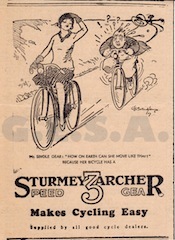 In 1902, Mr. Henry Sturmey and Mr. James Archer jointly developed a Three-speed gear device for bicycles together with Mr. William Riley. 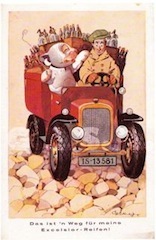 Their invention was improved by Mr. Alfred Pellant and Mr. G.P. 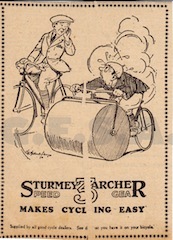 Mills of the Raleigh Company bicycle makers. 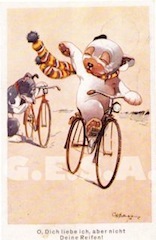 It proved a great success and has continued to been produced and improved upon to the present day. 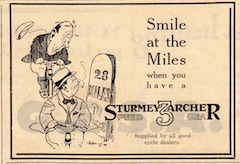 Continuing their advertising campaign that had featured illustrations by various artists since 1904, Studdy created a whimsical series of adverts in the late 1920s. 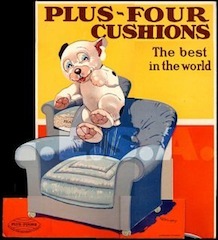 This shop display for Plus-Four cushions featuring Bonzo is another great example. 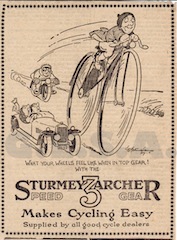 I can find no record of a "Plus-Four" cushion manufacture, or any matching brand. 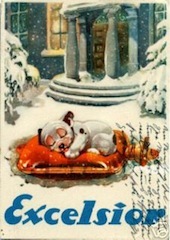 I can only guess that it would date from the early to mid 1930's by the style of Bonzo & Studdy's signature. 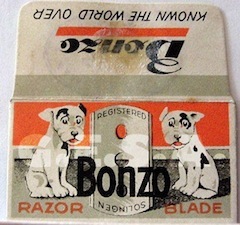 Bonzo Blades was one of the trademark makes by the German company Albert & Henrich Bassat in Solingen. 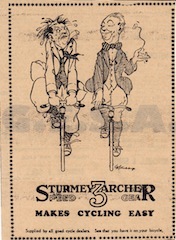 Here are a couple of examples of their Bonzo Blades packets by Studdy.